THE YEAR IS 1955. Eisenhower is president, the McCarthy hearings are over, and Lolly Candolin has given her father an ultimatum: “Stop drinking or I’ll cut my hair.” Her father, refusing to have his life dictated by a ten-year-old child, retaliates by tossing Lolly’s aged cat Bo, wrapped in a burlap sack, down into a gypsy camp from the high levee surrounding the town. Going against everything she’s been told, Lolly ventures into the gypsy camp on her own, where she befriends a cast of misfits, including: Tick, a tomboy her own age; Sophia, Tick’s mother and gifted healer; and Sam, the unofficial leader of Cougarville, and the owner of a pet cougar. It’s not long before Lolly and her new friends are caught in a maelstrom of murder and intrigue as the county sheriff is shot and killed at a local saloon, with all evidence pointing to Sam. Lolly’s father, the county prosecutor with everything to lose, goes after the case full bore, determined to see Sam convicted and executed. Things become even more complicated for Lolly when, during a clandestine mission to warn the Cougarville residents of her father’s brutal intentions, she discovers the identity of the true killer, putting into motion a terrible dilemma that no young girl should ever have to face. Revealing her evidence will not only set an innocent man free, but destroy both her father’s career and any chance of winning what she yearns for most: her father’s approval. Elizabeth Appell’s debut novel, Lessons from the Gypsy Camp, explores the tension between individualism and family obligation, the complexity of discerning right from wrong, and the overwhelming consequences of pursuing truth and justice. Flash: Lessons from the Gypsy Camp received Honorable Mention at the Paris Book Festival, 2013! When the blurb on a book’s jacket likens it to To Kill a Mockingbird, I put my hands on my hips and say, “Yeah right.” But the moving story told in Lessons from the Gypsy Camp by recently returned Nevada County native, Elizabeth Appell, earns its praise. This story and characters flung me right back to memories of Jeb and Scout and the unlikely but inspirational teachers found among their community’s misfits. Lessons from the Gypsy Camp is set in the Gold Country, in 1955. The town is near a levee and, though unnamed, will be recognized by locals as Marysville. On the outside, ten-year-old Lolly Candolin’s life is everything a child could want; a Victorian home, a successful father, and a beautiful mother. But behind the walls of their enviable house, Lolly’s unbending father and his excessive drinking bring his daughter to make a desperate and risky ultimatum: “Stop drinking or I’ll cut my hair.” Of course, this proves to be folly. But Lolly is as strong of will as her father, making good on her threat. The heart-wrenching story that unfolds puts Lolly in touch with the socially undesirable, but ultimately magical characters of the gypsy camp on the other side of the levee. Lolly is headstrong and heart-lead to the point of putting herself and others she loves in peril’s path in order to do what is right. Scout Finch would have been proud. This is a story written with adult sensibilities, but with lessons that older teens and young adults would love as well. 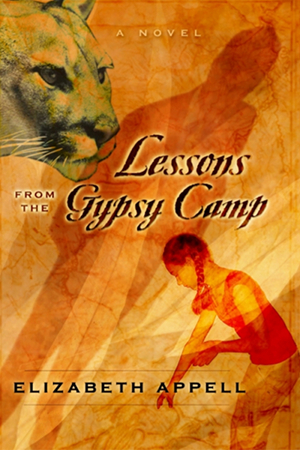 Lessons from the Gypsy Camp was honored with the Rebecca Reads Best Fiction Award for 2004. Appell is a multiple award-winning author and playwright. Her play “Moonwalkers” will be read in Los Angeles by Jamie Denton who plays Mike Delfino in Desperate Housewives. Her full-length play “Confessions of a Catholic Child” will be produced in spring of ’07 by the Virtual Theater Project Group of Los Angeles. Nevada County is so much the richer for having this talented writer back home. Betsy Graziani Fasbinder is a local writer and contributor to The Union. She came to Nevada County in 2005 in search of a home that welcomes artists, celebrates community, and revels in its beautiful surroundings. The lessons from the gypsy camp are well worth learning and are made all the more entertaining by the intensely vivid and endearing characters that teach them. Elizabeth Appell has brought to life truly believable characters, a challenge made all the more so by their innate uniqueness. And she could not have chosen a more ideal student and teacher than Lolly Candolin, whose sense of justice binds us to her while her stubborn strength, tempered by innocence, carries us safely through to a deeper understanding of the consequences of actions and the cultural assumptions that direct them. The book is an easy read with a challenging theme. You will be intrigued by this novel if you are not interested in sugarcoating male abuse and power. The image of the retiring ’50s woman makes more sense in this context. But the best part of the novel is the innate strength of the child, the intelligence of her common sense and the clear-eyed sense of justice that keeps her backbone strong, even in the face of utter rejection by the father she loves. There is an unspoken assumption of the possibiltiy of the purity of human love and spirit no matter what the environment. While some say this is next to impossible in this context, Ms. Appell sets a good case for the Jungian idea of each person’s participation in an historic consciousness of justice, fair play, and love. In this context Lolly does her share of carrying her society foward toward a greater sense of oneness and truth. Lessons from the Gypsy Camp is not at all what you think it will be—a pretty, mild little book about a girl learning to grow up. It is filled with anger & adventure. It stares without blinking at the times in a small American town & dysfunctional families; recreates prejudices without excuses, & describes danger, death, lying, cheating, and meanness without flinching. Yet, throughout, there are glimpses of redemption by screwing up courage to do the right thing, in the face of a disapproving father & his cronies, despite a mother who has almost been drugged & battered into submission. In the end, Lessons from the Gypsy Camp is a tautly written tale with much to teach. It is memorable, raw, and an ever-so-good read! Elizabeth Appell has done something wonderful in her novel Lessons From The Gypsy Camp. I sat down with this book during my own family crisis and came away from it with clarity and the gift of forgiveness. Ten-year-old Lolly Candolin is stubborn and determined to have the loving, stable family life she has seen among her friends. To accomplish her desire she confronts her father, Regan, the town prosecutor about his nightly habit of guzzling vodka while her mother suffers almost daily bouts of migraine headaches and episodes of depression. When he refuses to succumb to her demands, Lolly cuts her long hair, which she knows her father loves. Lolly begins a spree of defiance that leads to the suffering of severe consequences including abuse by her father. But Lolly also learns valuable life lessons from the small group of strange people who live on the other side of the levee in Courgarville. The girl is exposed to the power of friendship, the effects of judging others, and the conflict often associated with doing what one believes is right: “Sometimes we do the right thing because it’s good for somebody else.” Appell writes in a direct, open voice inviting the reader inside the mind and heart of a young girl struggling with loyalty to family and upholding her convictions. When one of the residents of the gypsy camp is accused of murder, Lolly discovers the identity of the actual perpetrator and defies her father who is troubled by demons of his childhood and job pressures to reveal the truth that sets her friend free. Lessons From The Gypsy Camp is multilayered and conflict-filled. Appell presents strong images and themes. Her writing is fluid moving the story easily forward even over the violent, raging rough patches in the plot. As I completed this book and compared the difficult decisions made by the strong-willed Lolly with the agonizing choice I was in the process of making in my own life, I was thankful for the powerful insight into life and humankind revealed in the story. Appell is a talented writer. Lessons From The Gypsy Camp is an excellent read. Lessons from the Gypsy Camp is a very compelling read, a “page-turner” as advertised. The characters are engaging, the messages important, the plot fast-moving, even exciting. The father’s change at the end is believable even though I could have bet against it earlier in the book. The writing is very good, major characters are complex, well-defined, and I do think the book would find an audience with any age group from middle school up. At times disturbing, perhaps because of its realistic voyeurism into a home wrought with alcoholism and mean-spiritedness, Lessons from the Gypsy Camp is riveting. The lessons within are many and humbling. Readers learn that children are often our best judges due to their innocence. They don’t allow preconceived notions to get in the way of love. Journey with a young gal who shares the heart of a person has nothing to do with their social standing. A lovely book for all ages. A perfect read for middle and high school youth to learn that standing up for what you believe in has glorious rewards. “Consequences. We all face them throughout life. For ten-year-old Lolly Candolin, consequences are unusually cruel. In her attempt at getting her alcoholic father to stop drinking, Lolly’s bold ultimatum costs her her beloved old cat, Bo, who is tossed heartlessly in a burlap sack into the Gypsy camp below the levee. A place that is positively off-limits to Lolly. Defying her father, Lolly goes off in search of Bo, and discovers a group of motley and colorful characters in the gypsy camp called Cougarville. It is here that Lolly meets the red-headed imp of a tomboy, Tick, who becomes her loving friend. The gypsies take a liking to misfit Lolly, sharing a secret with her that no one else is privy to. When one of the gypsies stands accused of murder, relations between Lolly and her father become increasingly strained. Lolly and her father are both forced to face consequences that neither may be ready for. In her debut novel, Lessons From the Gypsy Camp, Elizabeth Appell paints a realistic picture of a dysfunctional family in the 1950s. Amid prejudices, Lolly Candolin’s character shines forth with candor and sensitivity. Heart-wrenching and mesmerizing, Lessons From the Gypsy Camp will entrance you from start to finish! An engaging exploration of such issues as individualism and family obligation. Ten-year-old Lolly Candolin finds herself having to deal with an alcoholic father and a mother who uses medication to avoid having to deal with family issues. There is a gypsy camp outside of Lolly’s [town] where she is welcomed by friendly, colorful people whom [her] father, in his role as county prosecutor, has sworn to destroy. When the town sheriff is murdered and the evidence implicates the gypsy camp leader, Lolly discovers who the real killer is. Now she must decide whether to expose the murderer (which would destroy her father’s professional reputation and end any chance at securing his approval) or say nothing and let an innocent man die. Deftly embedded in a riveting story for your readers ages 8 to 14, is an engaging exploration of such issues as individualism and family obligation, the complexities of discerning right from wrong, and the consequences of pursuing truth and justice. Elizabeth Appell’s Lessons From The Gypsy Camp is an especially recommended addition to school and community library fiction shelves! No matter how many times it happens, a tale that can take us from our everyday surroundings and drop us into a whole new world will always carry the flag of a winner. Elizabeth Appell’s “Lessons from the Gypsy Camp” transports us so quickly we may not even realize we’ve gone until a sound or a smell jerks us back to reality. In “Lessons from the Gypsy Camp” reality is a typical town of the haves and have nots. A levee is the dividing line and once our young heroine crosses it, there’s no going back to the way things were. With characters who truly are characters, we learn about the folks with baggage and the folks with so much color and life to them they fairly jump off the page. And then there’s Lolly, our raggedy-headed heroine, who gallops us through this twisty little tale. With her blunt, up-front style, she quickly learns the consequences of her actions whether she’s at home, in the principal’s office, or in the dusty realm of the gypsy camp. With delectable touches of secrecy, a hint of mystery, and some heart-heavy baggage, we learn that the gap between both sides of this town is not really that large. And, luckily, pesky pertinence can come in handy when those who spend a bit too much time under the influence feel that winning at all costs is okay despite the guilt it will bestow on a loved one. Like Sophie’s magic utterances, sometimes a little confidence and truthfulness can work their magic on a soul that really does want it.